What does The Innovation Mentality solve for? The Innovation Mentality by Glenn Llopis reveals the alarming leadership identity crisis that has developed at companies of all sizes and across all industries nationwide that has created dysfunctional, tension-fueled workplaces and made it difficult to drive sustainable growth. These companies are solving for the wrong opportunities, widening productivity gaps, and unknowingly creating tension with and weakening the potential of their increasingly diverse and multigenerational workforce. They are dismantling the evolution of business growth as they simultaneously elevate the risk profile of the global economy. The Innovation Mentality puts a stop to all that. Its six strategies compel leaders to have the wisdom and courage to develop a new mindset that breaks free from the templates of old and to renew and reinvent the ways we work. The book shows leaders how business today has become less about the business defining the individual and more about the individual defining the business and what kind of leadership that requires. It forces leaders to be more vulnerable and intimate with people in the workplace and marketplace who have lost trust in and respect for those businesses and brands and have grown frustrated with how they are mismanaging opportunities. It enables leaders to embrace the intellectual capital that lies within the workforce and see diversity and inclusion as a profit center to create change and the future America needs. The Innovation Mentality is a transformational journey – an urgent call-to-action that will guide leaders and their organizations on how to immediately apply evolutionary thinking, strengthen their wisdom, achieve significance, embolden business models, and reinvent the workplace to create and sustain real competitive advantage in the marketplace. Reclaim your identity by breaking free from the one-size-fits-all templates and have the wisdom and courage to help you and your business, brand, and employees evolve from the fear of change. It’s time to embrace The Innovation Mentality. Embrace The Innovation Mentality and learn to . . . Marketplace growth and business evolution require leaders to immediately identify and close opportunity gaps by activating and leveraging the full potential of their workplace culture, employees, teams, partnerships, and client and consumer relationships. Growth and evolution requires leaders to take ownership of a new mindset: The Innovation Mentality. Do you Embrace the Six Characteristics of The Innovation Mentality? "When it comes to our diverse, multigenerational workforce and customers, leaders have been solving for the wrong things far too long. The Innovation Mentality provides the wisdom to solve for the right things and guide companies of any size to seize one of the last remaining true bastions of growth opportunity." "The Innovation Mentality clearly identifies how diversity of thought drives people and business to grow and evolve together. GLLG guides organizations to renew and reinvent how they lead to establish competitive advantage in today’s fiercely competitive marketplaces." "Our evolution and growth as a business is founded on an unwavering commitment to putting people, Customers, and associates at the center of what we do. 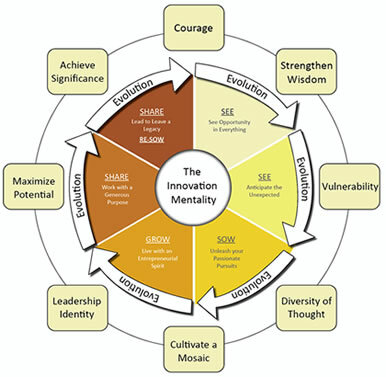 The six strategies in The Innovation Mentality elevate and strengthen our core values by reinforcing the importance of creating environments where authenticity is encouraged and deeply valued." "Coming out of the GLLG leadership workshop, I’m amazed at how my mindset has changed. I’ve built confidence in knowing who I am as a leader and influencer, what I bring to the table and how to communicate my strengths to others. Transformational experience." "Their experience in the corporate world and developing leadership development was a key component to the success of the Forum." "I had an unexpected and powerful experience through GLLG's leadership program. It was powerful in that, in a relatively short time, the program unlocked a significant well of human potential within me. It was unexpected in that I had not realized the depth of the power and potential that I had within all along. I am so grateful that I had the opportunity to take part in this life changing program. I am more self-aware and make better use of my "internal toolkit" today than I ever have before."